In my recent article “Rhythm and its importance in developing situational reflex” I discussed the need for martial arts drills to take place in a “dynamic context” – namely a context in which a rhythm can be established so that situational reflex can be inculcated. But what do people usually do when they wish to practice a technique? They isolate the movement into a “standing start” drill. A “standing start” drill is where one side is the attacker, the other side is the defender. 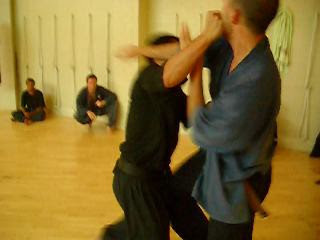 The attacker will start from a stationary position and launch an attack - often on a count called by the instructor, but sometimes of his or her own motion. Sometimes the attack will involve a step (eg. “ippon kumite” or “one step sparring”), sometimes it will involve just a lunge and sometimes it won’t involve any substantial movement off the spot. The most analogous drill in a game like tennis would be practising a return of serve; each serve is its own distinct play with no nexus to the preceding or succeeding one. Lately a few people have been at me to explain what it is that I have against “standing start” drills. Actually I don’t have anything against them. On the contrary, I think very highly of them and regard them as essential for starting to learn a particular technique/tactic. For example, it is very difficult to explain an application of a kata/xing/pattern/form without showing it in a “standing start” format. Accordingly, at the very least, the standing start drill is a necessary platform for application/technique analysis. Furthermore there are certain civilian defence situations that mostly occur from a “standing start”. In that case it is appropriate to practice against techniques launched from that platform – at least part of the time. However it is also true that I regard such drills as having fairly significant limitations. What are these? The principal limitation of “standing start” drills is that on their own they simply don’t inculcate a reflexive response in a free-fighting environment. The latter occurs in a dynamic context while the “standing start” drill does not. And as I discussed in my article “Rhythm and its importance in developing situational reflex”, a dynamic context provides you with cues for pattern recognition. Your subconscious can then match a situational reflex to these cues. But without a dynamic context there is little chance for the appropriate situational reflexes to develop. In a “standing start” drill, the defender knows exactly what attack is coming. And although the defender might not know exactly when the attack is coming, he or she still has a pretty good idea of this - whether through the instructor’s count, or simply because both sides have been primed for what is about to happen. So it is unsurprising that, when the attack is launched in a “standing start” drill, the defender successfully performs the requisite evasion/deflection and counter, both sides reset and it starts again. 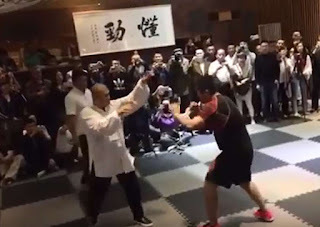 And it is also unsurprising that, when the defender comes to a similar point in unscripted sparring, all of that “standing start” / “one step” drill training falls by the wayside. I challenge anyone to show me otherwise – I certainly haven’t had any experience to contradict this conclusion in the 31 years since I started martial arts training. In short, there is insufficient nexus between the “standing start” experience and the unscripted sparring. The subconscious simply doesn’t recognize any pattern/rhythm from the “standing start” drill which it can match to the unscripted situation, and accordingly no appropriate situational reflex is established. But sparring is not fighting! However you might argue that you are still managing to inculcate a reflex response to a particular attack. So what if it doesn’t show up in sparring or some other unscripted practice environment? The only unscripted environment that matters is real life! If the reflexes you’ve gained don’t show up when you are in a “safe” unscripted environment (eg. your dojo, with friendly training partners), what hope do they have of showing up when you are facing the stress of a real confrontation? I hold it to be self-evident that fear, stress and adrenaline only serve to add layers of interference with reflex response rather than bring it to the fore. Students are more likely to freeze in the face of real danger than respond with their training. Indeed, if their trained reflexes emerge in combat, this is very likely despite fear, “adrenaline dump” etc. – not because of it! Accordingly I believe it is vitally important to ascertain, in various “safe”, unscripted environments, whether you have, in fact, actually grooved an appropriate situational reflex - or whether you have a "situational reflex blindspot" instead! If you have a reflex to deflect/evade/pre-empt a punch in sparring then maybe, just maybe, you might find it emerging against a punch thrown in a real civilian defence confrontation. 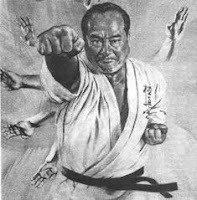 The more deeply grooved your situational reflex is in the dojo, the greater the chances of it being effected in the street. And if you’re not seeing it in sparring, what makes you think it is there at all? There are still those who will argue that they do see the reflex in the dojo – just not in sparring. They see it in the “standing start” drills. And these are “more realistic” than sparring! Well, it’s true that “standing start” drills give you a situational reflex. However it’s not the one you imagine! What is the reflex grooved in “standing start” drills? Sadly, there really is very little wider reflex inculcation than that in the case of “standing start drills”. When someone argues that their “standing start” drills are “more realistic” than sparring, I also think they’re confusing issues. As I note in my article “Rhythm and its importance in developing situational reflex”, “realism” and “reflex” are totally different things. You will recall from that article that dogs preparing for hunting/fighting don’t enact “standing start” scenarios, featuring short sharp bursts of faux aggression and other attempts at “realism”. Rather, they settle into a slow, brawling, rhythm where they try to groove situational reflex. Natural selection has favoured abandonment of “realism” in "fight preparation" of animals (at least to a large degree, as I will elaborate on below). I think that it is almost certainly because reflex training is more important - and any attempts at “realism” would be woefully inadequate anyway. Make no mistake - the play fighting is still visibly related to real fighting. For example, it doesn't look like a courtship ritual (which is part of many animal species' instinctive behaviour). Rather, it does look like slowed-down fighting. There is even a kind of "toned down intent" (more on that in my next article). It's just not "realistic" in the sense of tempo or intensity. We humans obviously have far greater cognitive power and future-planning ability. Accordingly, as I've noted in my previous article, we are not limited to "play fight" sparring in our preparation. Yes, you should practice “standing start” drills. And, with the appropriate protective gear, you can add levels of contact that might approach those experienced in the street. You can create “more realistic” scenarios, enact aggression etc. (more on the limitations of "realism" of "standing start" drills in a minute). 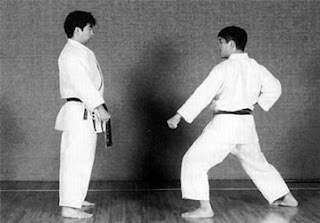 But in the end, this type of exercise is primarily about learning and refining a technique – not about whether the technique will arise reflexively in an unscripted situation. 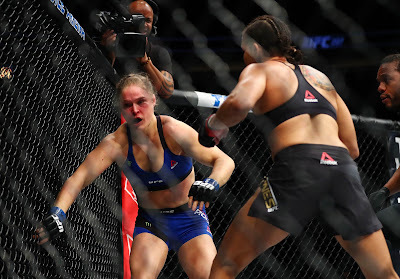 And while your technique might be tested and found to work very well indeed in a scripted, “standing start” environment, it will be of no use to you if it never sees the light of day because you suffer a “situational reflex blindspot” (as happened to Randy Couture and Vitor Belfort when facing front snap kicks). Accordingly, we humans need to develop intelligent drills that give us a more scientific, targeted means of situational reflex inculcation. This is where we "improve" on our animal counterparts - not by focusing our attention largely (or even exclusively, as I know some do) on "standing start" drills. To be clear: “standing start” drills are necessary for practicing techniques. But they are next to useless for grooving a situational reflex for unscripted environments. After you’ve practiced each of them numerous times, have you partner choose from the 3 attacks at random so that you don’t know which you will receive at any particular time. Having tried this training method over the years, I can tell you that you'll be lucky to correctly predict and defend even one out of every three random attacks. Why? I think this is because there simply is no “transfer” of reflex from one “standing start” drill to another. They are like islands, separated from each other by a great expanse of sea. And we haven’t even got close to the chaos of free sparring – never mind real fighting. What constitutes the “sea” that separates these drills from each other and from unscripted fighting? The answer is: contextual movement. 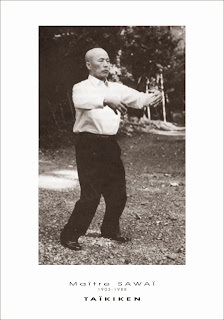 It is this contextual movement (comprising set-up of, and recovery from, techniques), and the natural rhythm of that movement, which gives the brain vital “pattern recognition cues”. In turn, the brain matches these cues to a reaction you’ve learned to associate (subliminally) to those cues. 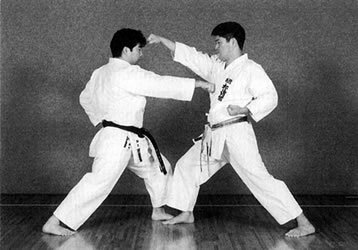 So you’ll find that if a person has just completed a cross punch, the recovery from that will affect the means by which he or she will approach a subsequent technique, be it another attack or a defence against one of your counters. If a person has lunged forward with an attack, certain rules govern what can and cannot happen next. 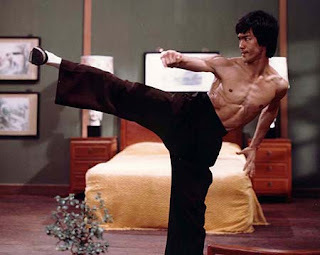 Ditto when a person throws a roundhouse kick to your thigh/knee, and so on. Human movement might be almost infinite in possibility - but it nevertheless obeys some sort of logic or rhythm. The options are necessarily constrained by the context. Good reflex-training drills will grab meaningful and useful (ie. 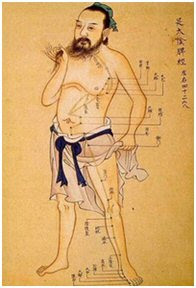 frequently occurring) “bites” of this context and enable the practice of techniques within that context. Of course the problem with “standing start” drills is that they feature very little context. What context there is (eg. when schools enact “realistic scenarios” with some pushing and shoving preceding an attack) is often highly artificial, relying on the acting skills of the practitioners rather than any realistic, subliminal pattern recognition, and appropriate reflex matching, by the brain. Even our most “realistic” self-defence scenarios are really nothing more than pantomimes - someone’s impression of a very small number of possible “start” scenarios. Also, consider that most “standing start” drills focus on a single attack. The most impressive of these drills involve literally dozens of counters that follow from this single attack (see my article “String theory: combinations and their effectiveness”). But in reality we all know that people don’t attack you with one punch/kick/strike. More than likely they will come at you with arms swinging away - multiple punches raining down upon you, kicks following. The idea that someone will take a single swing at you and then pause while you inflict upon him a series of devastating counters is plainly ludicrous. In fact, the most common assault I’ve seen as a prosecutor involves at least 2 punches in quick succession. Show me a “standing start” drill that follows this model, and it will be the exception. That “standing start” drills never reflect anything other than the first second or so of a civilian defence situation (ie. an initial attack) is a whole other story. As I’ve noted in my articles “Boards don’t hit back” Part 1, and Part 2, even if a fight lasts only 30 seconds, the “start” component (as significant as it is) will only occupy 1/30 or less of it. When I was anchoring my radio show (the Combat Sports Show on 91.3 SportFM) I once had a guest who proudly proclaimed how his system involved no sparring at all - it was based exclusively on "more realistic" "standing start" drills. He said (in answer to another guest, who was an experienced ring fighter) that "I wouldn't know what to do in sparring - I would probably kill someone". In other words, he doesn't have time for inculcating less than optimal reflexes. He's too busy inculcating "killing" ones. I wondered then, and I wonder now, what possible reason he had for thinking this. He's certainly never tested his reflexes in an unscripted environment to see what would happen. Given my own experience with the limitations of "standing start" drills, I have no doubt at all that this fellow was/is living in a world of fantasy. 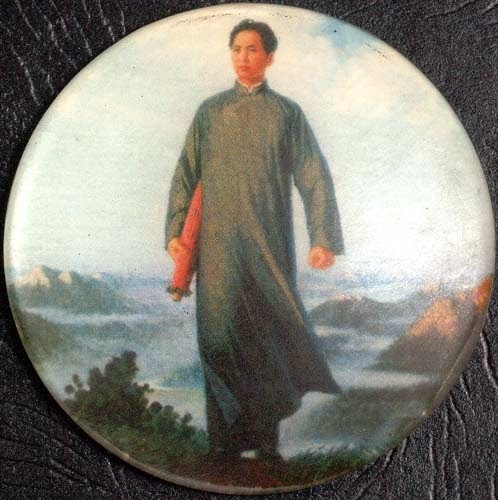 Under real pressure, his techniques, practised exclusively in "standing start" drills, are unlikely ever to see the light of day. 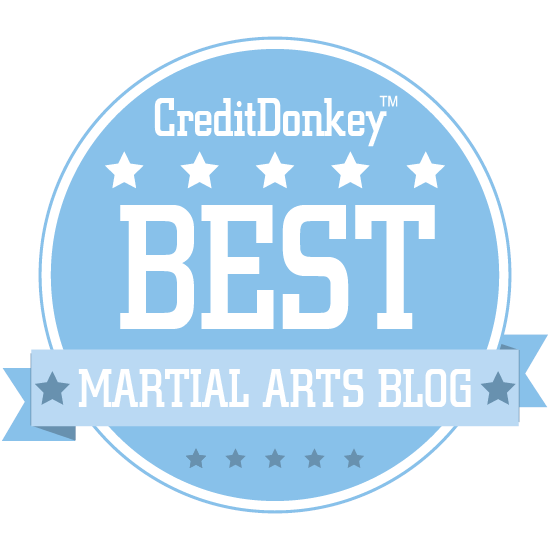 All martial artists need “standing start” drills. But they are useful for learning, refining and testing techniques – not making sure that those techniques arise as appropriate situational reflexes. The central problem with “standing start” drills is that the dynamic context of the attack is largely absent. An attack might occur from a stationary position - that’s true. But it might equally occur when you and your opponent are mid-way through a scuffle. It might be the first, second or third attack in a series. It might be something you face as your own attack has been evaded/thwarted. The situations are endless. We don't need drills to attempt to replicate each of these endless situations. That would be impossible - a fool's errand. Rather, we need drills to replicate the dynamic context of those situations. Why? To enable the inculcation of situational reflexs through use of pattern recognition and rhythm. We can’t assume that the “standing start” will even begin to reflect the dynamic context of an unscripted situation. They can't. "Standing starts" are just snapshots of some of these. They are certainly not representative of any of their patterns and rhythms. And the poor transition of techniques from “standing start” drills to unscripted training is a good indicator that this is true. We can choose to ignore this data, but it doesn’t lie. In other words, “standing start” drills need to be supplemented. But with what? As I discussed in my article “Rhythm and its importance in developing situational reflex”, sparring is part of the equation – but it is principally about testing situational reflex rather than developing it. Accordingly, what we really need are drills that approach the whole issue of situational reflex on a scientific, time-efficient basis, rather than an ad hoc one. We need drills that occur in a dynamic context. 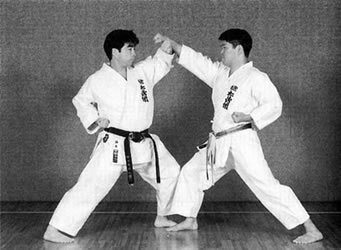 Such drills, in combination with sparring (which tests our situational reflexes) are going to be the biggest factors in transferring your traditional techniques from kata/xing/forms/patterns and the related "standing start" displays into unscripted civilian defence situations situations. During my Goju training, although we did include a lot of free sparring, there was a lot of so-called 'standing start' drills. Often these two areas of training seemed so distant from one another, almost unrelated. Our heavy training on 'standing starts,' didn't serve everybody well, necessarily. I remember one unfortunate 'multiple man' scenario where one of my training partners stood, absolutely composed and still, in the middle of the circle. 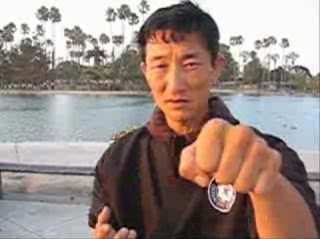 I walked up to the guy and threw a punch right at his face, which he absorbed with his nose, giving only a stunned look. After all that training, there was no block, no attempt at evasion. I felt bad, but I wonder if that was a result of those skills learned primarily in 'standing start' situations NOT transferring to more dynamic situations. 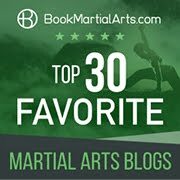 What I love about this blog, Dan, is that you both identify things I unconsciously observed (but have been utterly unable to articulate) about martial arts training and also go on to discuss the limitations/benefits of them. Incidentally, in capoeira there is almost no 'standing start' training. In fact, some would argue that the only way to learn is by 'playing,' within the dynamic context of the roda itself--not quite sparring, but an endlessly changing environment. Whatever else capoeira's 'practical' flaws, I'm beginning to see the wisdom in this. Traditional Asian arts once had a strong emphasis on flowing partner drills. Sadly, these are falling out of favour; they are seen as anachronisms and "dance-like". Instead, standing start drills, which have their place, have been elevated to a position they don't deserve. I hope to make people aware of this trend - perhaps even reverse it! Thanks for your comments, input and encouragement Patch! I've also wondered about the value of insular training - in the Praying Mantis video (for example) they only used their flowing drills on other people from the same style. There's even less chance for dynamic scenarios if you always train/test with the same people and style. I have slowly seen a shift in my approach to the bunkai and ippon Kumite. 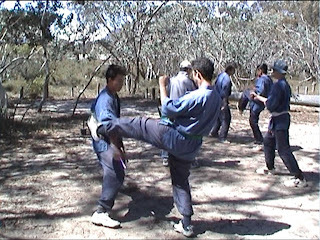 Also my Dojo practices "Juju Ippon Kumit" Where the practicioners move around as if sparring, and a target is announced. The variable in this type of drill is that the technique and exact time of the strike is not known. This type of drill has helped me develop a sense of moving around in my area, and trying to read techniques. Great advice on different approaches to drills, thanks for the help. 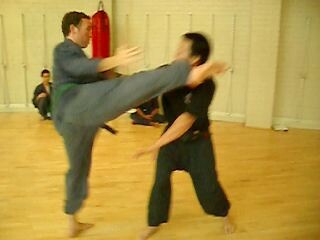 We do the same jiyu ippon kumite as well - it's good training. As are "standing start" drills. It's just that each has its limitations and I felt I should describe these before the idea left me! Thanks very much for reading and for your comments.